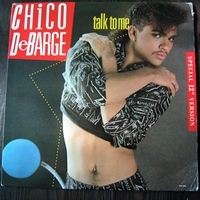 White Label Wednesday: Chico DeBarge, "Talk to Me"
David Medsker is kicking up the bass for another beat-heavy installment of White Label Wednesday, and — hey, who let Chico DeBarge in here? Everyone has that song that they like beyond all logical explanation. This is mine. The rational part of my brain knows that this a ‘pieces parts’ kind of song. The rhythm track and bass line are a near note-for-note ripoff of Janet Jackson’s “What Have You Done for Me Lately,” which stormed the charts nine months earlier. Chico’s vocals are wafer-thin, and while it’s tempting say that this would explain why he was never allowed to be in the band that bears his name, that would be giving his older siblings far too much credit. Lastly, sweet Jesus, look at that cover. Hideous ’80s hair, and an equally hideous, midriff-baring outfit to go with it. What they didn’t steal to make this song, they took from a dumpster and assembled with duct tape and discarded wallpaper. And I like it anyway. But, as Gloria Estefan once ominously predicted, the rhythm is gonna get you, and the beat to “Talk to Me” sure as hell got me. It even got Gary Pressy, the organist at Wrigley Field, who still (!) plays the chorus to “Talk to Me” whenever a coach leaves the dugout to talk to his pitcher. Pressy started playing for the Cubs in 1987, so for a moment, he was on the cutting edge of contemporary hit radio. I’m just going to sit back and let that thought sink in for a second. I didn’t have any luck finding the video for “Talk to Me” on YouTube – though there is a hilarious clip of Chico performing the song on “Soul Train” – but as it turns out, I found something even better: a homemade video that someone put together when it was first released, chock full ‘o dope dancing and Raid-sprayed candles. God love this guy for having the guts to show this to the world. Some might laugh, but I actually think it’s really sweet.